As my contribution for this week’s Thursday’s Children, I thought I’d share an idea for a potential story I’ve had in my head for a while now . I may never get round to actually writing it but I thought I’d tell you about it because I think it’s quite an interesting one. It’s kind of a sci fi idea. This is unusual for me because I haven’t really written any sci fi before. My idea is as follows – what if someone (I kind of weirdly imagine that someone as me, although I think actually it should be a fictional character!!) at some point discovers a way of travelling back in time (OK – that’s very much NOT a new idea, I know) but with a specific purpose in mind. That purpose is to steal authors/songwriters/any other kind of writers ideas for what becomes their big success in the future. So for example think of J.K. Rowling. Yes I realise I’d probably have to create a ficitonal incredibly-successful-author (although not necessarily). But what if someone found a way to travel back in time and steal her ideas, maybe before she’s even come up with them? Maybe this someone takes copies of her novels back with him/her into the past and somehow passes them off as their own. This is with the idea of getting all of her wealth and success etc. But this person (or people) are not alone. They are being chased by the authorities from the present day whose mission is to prevent them from being successful, to safeguard the copyright. I know it may not be much of an idea, but I found it interesting. Just the thought that ‘hey if I was completely unscrupulous and didn’t give a **** about right and wrong, wouldn’t it be great to go back in time and steal these big ideas that incredibly successful people have had before they’ve even thought of them’. So then their ideas would be mine mmwhahahaha!! Seriously it is a thought. If it wasn’t J.K. Rowling’s ideas I – or rather my character whoever stole it – could be some famous author from the past whose work the character could pass of as their own. Yes I know I’m always banging on about Jane Austen, but she’s a great example. Think of how wealthy she’d be if she was alive now. Like a billionairess or something. Very rich anyway. And so if someone were able to go back in time and steal her ideas, they could then have them published in the present and pass it off as their own. I know the copyright on her work has long since finished – hence all the sequels written/Jane Austen-like chick lit books – but if someone had the original ideas maybe they could have all the success in the present day and become filthy rich. Just a thought. As I say I may never get round to actually writing this. But for a final few thoughts, the title of this blog post makes me think about what copyright really means for us authors. The online Cambridge dictionary defines it as: ‘the legal right to control the production and selling of a book, play, film, photograph, or piece of music’. And copyright is incredibly important for us as indie authors. We don’t, of course, want anyone ripping off our work. But I think as authors using socia media, we have to take the risk that if we share our thoughts on our writing and share our work, in theory at least someone could come along and take ideas from us that are not theirs to take. But for me the benefits of sharing ideas, as in this very post, far outweigh the risks of being copied, of our ideas being stolen. And anyway, since Jane Austen died nearly 200 years ago hasn’t she been copied and plagiarised millions of times? Yes all right I hear your shouts of ‘but she’s dead, we’re not and we don’t want our ideas stolen’. That is true of course. But if we don’t take the risk of putting our work out there, we lose out. So for me I think I’m going to take the risk and continue to share excerpts and ideas of my work. 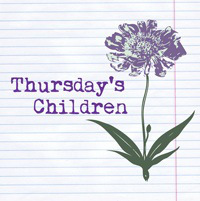 If you would like to join in Thursday’s Children simply write on your blog about what inspires and influences you as a writer. Then add your details to this linky. Many thanks to Rhiann Wynn-Nolet and Kristina Perez for hosting. Thanks Jade. So do I.
Don’t give up on the idea 🙂 It has merit! Copyrights are essential these days. And although there are some original owners long dead, their estates keep the copyrights updated – the song Happy Birthday for example. I wonder if Jane Austen’s books would be “successful” if they were published during our time (and hadn’t been published earlier)? It seems that timing has so much to do with an author’s success, hitting that reader-nerve at just the moment the reader craves what the author is offering. Some authors have had success by offering their work “for free” and building a fan-base. Once the fan-base is established, then they start charging for their books and people are very willing to pay. Hope that works OK. If not let me know. I’m really not surprised. What did make me laugh is that rejection language is so standard across the board. I know what you mean. I guess I kind of have sour grapes about the whole traditional way of publishing because I’ve never even been accepted by an agent. I suppose if I had been I would be much more positive about it all. But it’s quite telling that those synopses etc. of Austen’s novels were rejected. I like your idea, you should try and play with it a bit more. Hope youe’re having a great writing week! As you know I’m all about time travel 😉 so it sounds like an interesting idea to me. We’ll have to discuss it further next Thursday! I love time travel too – and messing with history, because what are the knock on effects? And what issues would the character have to deal with even if they did successfully steal the idea. Once the money and fame wore off, where would their self-esteem be knowing it was all based on a lie. And what happens if they are exposed? Look what happened to poor Milli Vanilli. Fun idea! Reminds me a bit of Bif in Back to the Future II giving that book of horse race outcomes to his younger self! It’s ages since I watched those films, but I think they’re wonderful and in some ways quite thought provoking. Like how it would be wonderful to be able to change the course of history and people’s lives forever. It sounds awesome! And I love sci-fi. You can never have too many time-travel stories, especially when they add a twist, as yours does. I’ll leave you with this thought. Travelling back in time gives a person so much power… the power to change anything. Why would they choose to steal a famous author’s idea? They must have an obsession with achieving fame… all they care about is success. Thanks so much for that John. It’s great to have your thoughts. And you’re right – the sort of person who would do something like that would have to be in it for the kudos at the very least. I may well look in to writing it. Seems like people agree with me that it’s an interesting idea.